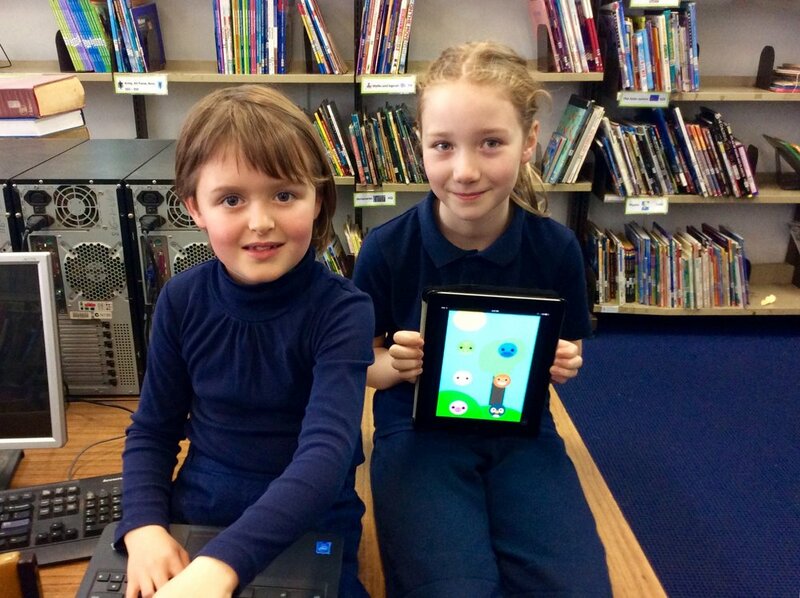 Woodend Primary School is a leader in innovative use of technology in student learning. We pride ourselves on giving our students the necessary skills to be fully equipped for the future. Students have access to a range of innovative digital technologies and resources. Our students have been invited to conferences and digital learning showcases to demonstrate their exceptional use of technology. Nell & Poppy showing the app they made which is available on the Apple App Store. Students are introduced to coding in the foundation levels and are extended throughout their journey at Woodend Primary School. Following a four step plan of Immersion, Development, Application & Exploration, students are able to grow their skills to do more than just code. Our belief is that coding lends itself to more than skill learning; it allows students to Create, Grow, Change the World, Teach, Problem Solve, Learn Life Lessons and Lightbulb. The school has built up a large collection of iPads and computers over recent years. As a result, there are 42 iPads which are shared between our Junior Unit classes. Our Middle Unit has access to a class set of 28 iPads as well as desktop computers. Carlsruhe students are equipped with a combination of netbooks and desktop computers and our Senior Unit students each lease a netbook for ongoing access. This compliments their innovative learning in the classroom. Two students using the iPad to code their drone. From Google SketchUp to a 3D model. Two fine examples of our students' creativity being brought to life. At Woodend Primary School, we have a 3D printer that students can access to bring their visualisations to life. We strongly believe in real world learning and open-ended inquiry. Our 3D printer is just one mechanism through which we are able to assist our students to action an idea. In 2016, Woodend Primary School investigated and invested in a range of robotic resources to help our students use their coding knowledge in real world settings. We have Blue-Bots, Edisons, a Dash & Dot, two classroom Hummingbird Robotic Kits and a set of programmable Mini-Parrot Drones. These are used in a variety of ways, and allow us to cater for different learning styles. Dash & Dot are utilised throughout the school in many ways.